Successfully Added Old Faithful Senior Citizen Cell Phone to your Shopping Cart. Just what the doctor ordered! 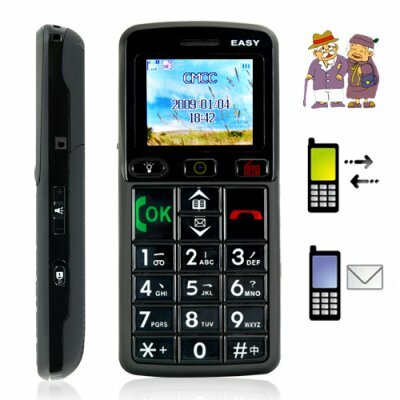 A practical cell phone that is specially designed for senior citizens! Lots of what you need, and nothing you don't! Tired of those small phones with dial buttons so small that unless you have pencil fingers you can't make a call? Not exactly user friendly for people with arthritis, rheumatism, or poor eyesight right? In contrast, the CVLO-M61 has jumbo sized keys which make calling a breeze! This safe phone also has text to speech time information and key confirmation for those of us who are hard of hearing. I said, "for those of us hard of hearing!" Instead of hearing tones when you press keys, a pleasant female voice reads out the numbers you're dialing. But that's not all. Old Faithful also has an easy to use flashlight you can activate and deactivate with just one button on the front of the phone! Now for the beautiful part: The CVLO-M61 comes with an SOS button on the back of the phone that you preset with an emergency number of your choice. When you need it, a quick press, and you'll be connected with your spouse, your children, your doctor, or whatever emergency contact person you designate. What's more, if you aren't able to speak, an SMS text message is automatically sent to that same person notifying them you need help right away. As for regular phone functions, Old Faithful delivers in style. You get an attractive unlocked mobile phone with a brightly lit screen. Icons are nice and big. It can store 500 contacts and is unlocked so you can use it with whatever cell phone provider you choose. Basically, the CVLO-M61 is great for first time cell phone users or people generally intimidated by technology thus making it the perfect gift for parents, grandparents, or yourself if you find that modern phones just don't give much consideration to an aging population that has no use for silly things like interwebs or iPhone naps! Why is this phone called Old Faithful? Because it's for the elderly and it's dependable. Also google "old faithful". Because we took out all the technogadgetry that senior citizen's don't require and just left in the essentials. Have this phone Russian language? This is the perfect phone for my mother!